In the lead-up to the announcement in August of the CBCA Book Of The Year Awards, Team Megan’s Blog plans to bring you reviews of as many shortlisted books as we can. 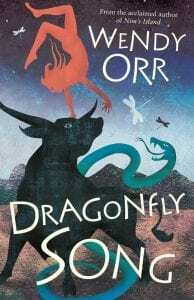 This week, Australian author Sue Whiting reviews Dragonfly Song by Wendy Orr, shortlisted for the Younger Readers category of the CBCA Awards. Themes: mythology, identity, loss, slavery, survival, courage. Click on cover image or title links to read more and to purchase. FREE SHIPPING CODE is EOFYS (until 7/6/2017). This epic tale tells the tragic story of Aissa, the firstborn daughter of a priestess, who is cast out as a newborn baby because of a minor deformity. When raiders kill her adoptive family, Aissa is abandoned once more. She becomes mute, considered cursed and given the name of No-Name. No-Name is raised as a slave and doesn’t learn of her real name of Aissa – meaning dragonfly – until she is twelve. In Orr’s richly imagined world, the Bull King takes tribute from the island each year. A thirteen-year-old boy and girl are taken to away and must dance with the bulls in the ring. No one has ever returned. For Aissa this represents her only means of escape and when the opportunity arises unexpectedly, she seizes it. But to survive the bull ring she must embrace her true nature, her special powers and also her heritage. An unusual blend of verse and prose, set in Bronze Age Crete and inspired by the mythology of the time, Dragonfly Song is an example of an author at the top of her craft. The ancient culture depicted is vivid and full of life, the writing mind-blowingly beautiful and the plot both poignant and thrilling. About the author: Wendy Orr is a Canadian-born Australian writer. Her books for children and adults have been published in 27 countries and won awards around the world. She is probably best-known for her Nim’s Island series. About the reviewer: Sue Whiting has written numerous books in a variety of genres: fiction and nonfiction, picture books through to YA, including the best-selling The Firefighters, and the award-winning A Swim in the Sea. Her latest book Platypus, illustrated by Mark Jackson, was a CBCA 2016 Notable Book.